RTJ joints are indicated in applications high pressures and temperatures. They are designed to be accommodated in specific slots and flanges contact surfaces of the gasket and the flange must be carefully machined and finished. 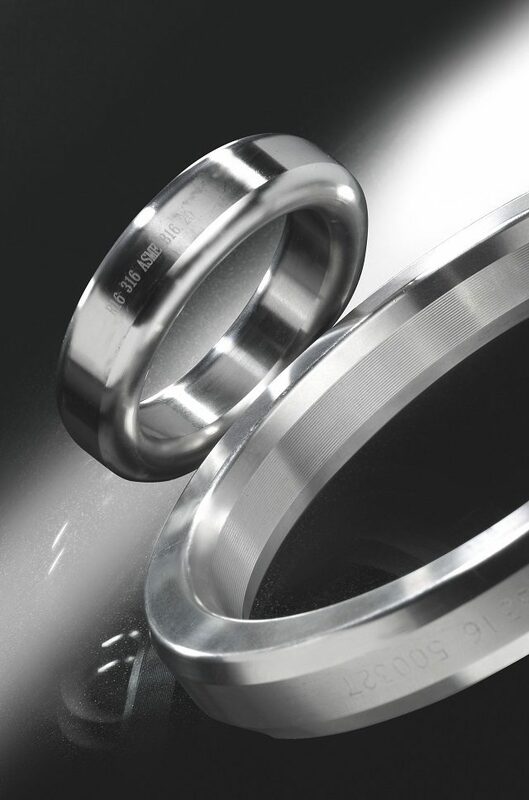 They are particularly suitable for very high pressures, up to 1000 psi. The RTJ gasket material should be a little softer than the flange itself to avoid damage to their faces. This product can be in 4 different profiles, but the most common are Octagonal and Oval. They are used mainly in oil installations in drilling equipment and assemblies of valves and pipes and pressure vessels in some high performance. • Or according a drawing. faces which means that the gasket is fully confined on both the inner and outer diameter. The maximum surfaces finish of the TG32 sealing faces shall not be greater than 0.8 um Ra / 32 in RMS. The style RX is an adaptation of the RTJ TG30. It is designed to fit the same groove design as a TG30 joint. The geometry of this modified design induces a pressure energising effect when the assembly is pressurised improving the efficiency of the seal. Surface finish of the TG33 sealing faces shall not be greater than 1,6 um Ra / 63 in RMS. * Other hardness under request.